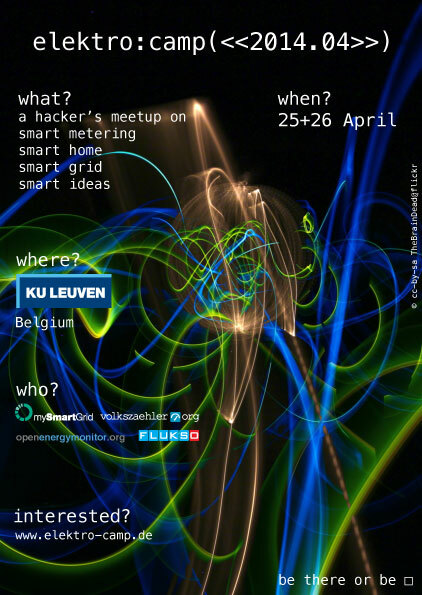 Join us at elektro:camp(«2014.04») on 25+26 April 2014 in Leuven, Belgium! This is the 8th meeting of the open source metering community. The concept worked very well at the previous meetings in Kaiserslautern (October 2010), Stuttgart (May 2011), Groningen (November 2011), Offenburg (May 2012), Leuven (October 2012), Kaiserslautern (April 2013) and Texel (November 2013). You're thinking of participating for the first time? To get an impression of the previous elektro:camp you might want to take a closer look at the proceedings. EC1311 Proceedings will be added shortly. For questions and other info, please contact Paul-Armand Verhaegen.